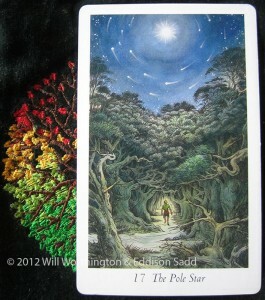 This weekend we’re joined by The Pole Star, the Wildwood’s answer to The Star in the RWS. Firstly, I’m sorry I didn’t post this card up yesterday (Friday 23rd) but I was simply too tired to concentrate or to think. However, the message is carries for us isn’t just for one day, this is your weekend card, so please do enjoy! The image shows a human, probably The Wanderer, emerging from a dark forest to see that the stars and the moon are in a rotating pattern above their head. The Universal Lore that created us is at work on our behalf, so be careful what you wish for, you might just get it but it might not be what you need. Wish for what you need instead, let your intuition speak to you and follow its path. There is a new era or path now open to you that maybe wasn’t before. I love these signs, these direction changes in life. We all need them, the straight road, or the motor/free way is SO tedious when it just stretches out before you for miles and miles and miles. There are times when we need the straight roads, especially after lots of meanderings, twists, turns and dead ends, but we don’t need it all the time! There has to be variety and like the UK motorways, a little countdown to the next exit / junction is always welcomed! This is what I see the Pole Star being: it’s your 300 yards countdown marker to the next junction. The question is, do you want to come off at the next junction? What does the next junction hold in terms of adventure, life changes, career opportunities… The list is ENDLESS but it comes back to what you NEED, not what you WANT, for the two are often not one and the same. Working out what you need though, is tricky, but all this week we’ve had signs with the 2 of Arrows, The Moon on Water, The Four of Stones, The Three of Vessels, The Alder… have you paid attention to each sign as its come up? If not, I can help and you can book your session with me via this page. Blessings and thanks for the patience folks!